WordPress is one of the world’s largest blogging platforms. It is used by the top bloggers and beginners alike. Even this blog was built on WordPress. Although easy to use, I have found it to be a great way to grow a global online presence. It has helped me build a business online that can be managed from any part of the world. However, WordPress is not only a blogging platform. It is a complete content management system that can be used to create many different types of websites. In this article, I will show you how to start a WordPress blog quickly and easily. Let’s get started! I have been hosting multiple WordPress sites on Bluehost Web Hosting. For only $3.95 a month, Bluehost can help you set up and host your blog. 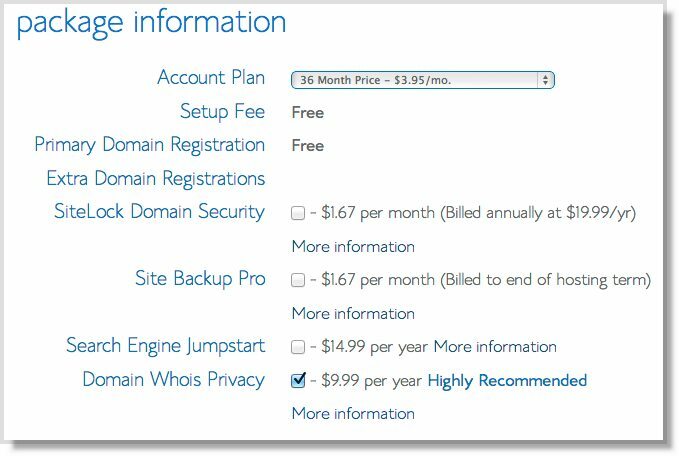 Because JayLehtinen.com is a Bluehost affiliate partner, my readers can use this link to receive a 50% discount off the monthly price and a free domain name. There are many web hosting companies out there. It may be difficult for a beginner to know which host is the right one for them. 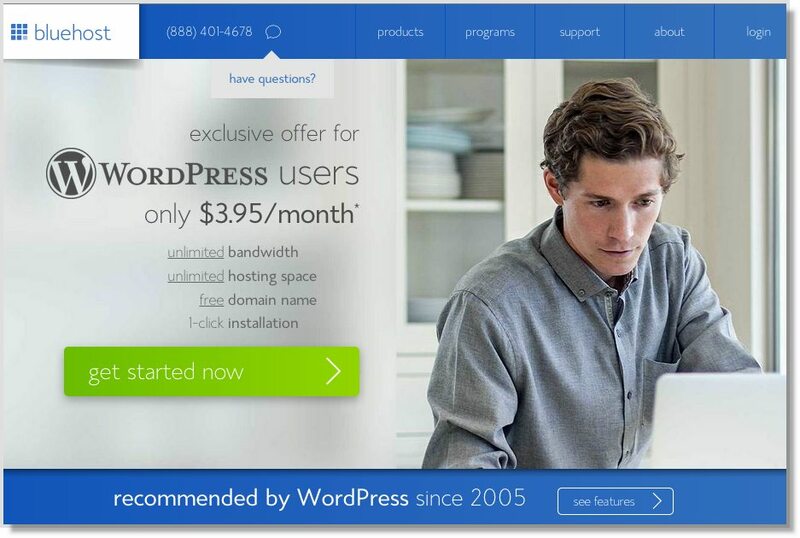 If you are starting a WordPress website, Bluehost should definitely be considered. Their web hosting packages are specially optimized to provide the best performance with WordPress. To sweeten the deal even more: If you sign up through this article, you’ll get a special offer for shared hosting starting at $3.95/month. You will also get a free domain name for a year! Follow the steps below to set up your hosting account on Bluehost. It will speed up the process to think of a domain name you want to use, and to have your credit card or PayPal information at hand for payment before you get started. Now choose a hosting package you wish to purchase. I recommend to go with the Plus plan for unlimited data and email storage. If you are planning to run only a single small website, the Basic plan is okay. Either way, if you ever need to upgrade your hosting plan to a better one, Bluehost provides seamless upgrades to VPS or dedicated server hosting accounts right from your control panel. Next, you need to choose a domain name for your site. If you already own a domain name, you can enter it here. You will just have to go through a few extra steps to get your DNS from your domain registrar pointed to Bluehost. If you don’t have a domain name yet, you can register one during the sign up process. The best part is, that it comes free with your new hosting account purchase. 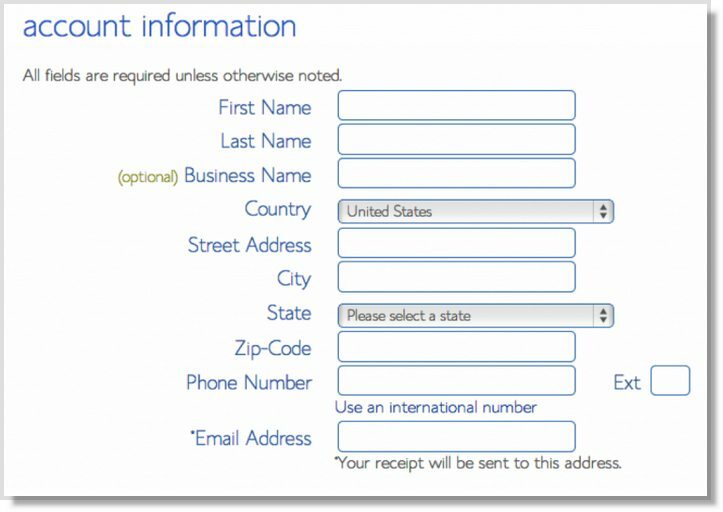 Once you’re done setting up your domain name, continue to fill in your personal information. There are few other offers provided at sign up, which you can include at your discretion. One I recommend is Domain Privacy. It is a paid service that allows personal information to be kept private on WHOIS databases. After you’ve filled in your information and chosen your hosting package, click the “Next” button to complete your purchase. You’ll be asked to create a password for your hosting account. Use the Password Generator to create a strong and secure password, or create one yourself. For your security, it is required to have both capital and lowercase letters, a number, and a special character (? !#, etc.) in your password. Now that you are signed up, you may proceed to log into your account. 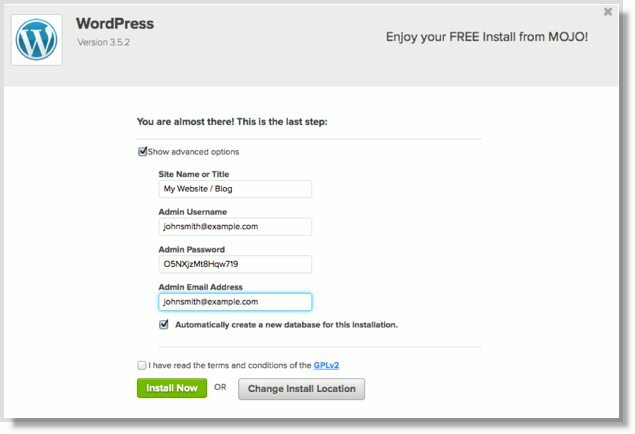 You can now get started installing WordPress! Bluehost has worked hard to make this one of the easiest things for you to do. They have a new MOJO Marketplace for installing WordPress and other applications. 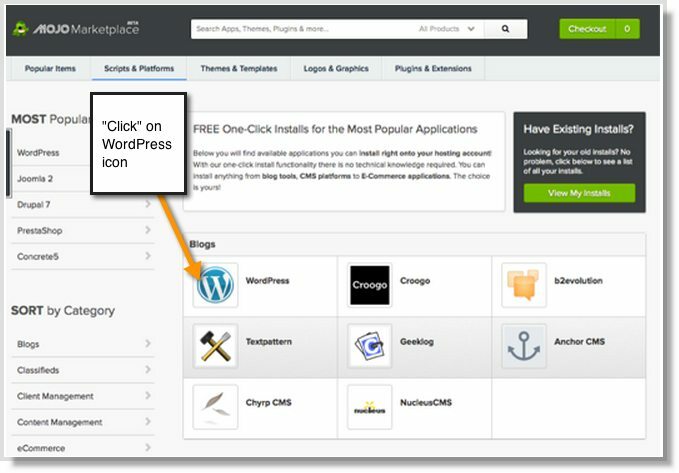 In your cPanel, scroll to the section titled “MOJO Marketplace” and choose the “One-Click Installs” button. This will take you to a page inside MOJO Marketplace called Scripts and Platforms. The blog section is at the very top, so all you have to do here is click on the WordPress icon. This will open the installation window. 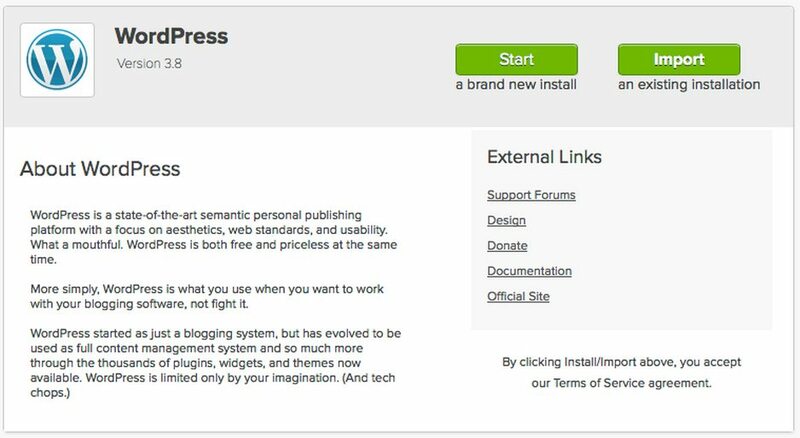 Click on the green “Start” button to begin the WordPress installation process, which has a few easy steps. This can be any domain on your account, or a subdomain or a folder for one of your domains. Next, click on “Check Domain,” which will make sure the domain is assigned and pointing to your account. At this point, you may get a warning that you are overwriting files. As long as you don’t have another website built yet, you can check the box and continue. This is mostly to make sure that you really want to install in that location. If you do have other sites built, you will want to make sure you’re not overwriting anything important. This section allows you to set up your own username and password for your WordPress install. NEVER use the default username “admin” for your login name. ALWAYS use a strong password with capital letters, numbers, and special characters mixed in. Make sure that the “Automatically create a new database for this installation” box is checked, unless you have a database already set up that you want to use. Now you can log into your WordPress site. Do this by going to the admin login URL. Enter the username and password you created earlier and click “Log In.” This will take you to the WordPress dashboard. From here, you can control everything to do with your WordPress site, such as creating pages, writing posts, and changing the appearance. Remember, if you sign up through this tutorial, you’ll receive a special offer of shared hosting at $3.49/month, as well as a free domain name for a year! I have hosted multiple WordPress sites on Bluehost Web Hosting. For only $3.95 a month, Bluehost can help you set up and host your blog. Because JayLehtinen.com is a Bluehost affiliate partner, my readers can use this link to receive a 50% discount off the monthly price and a free domain name. This entry was posted in How to, Web Hosting and tagged Blog, Web Hosting, WordPress. well as will share this on my social networks circle. Many thanks to share this wonderful article with us!